THE FAIR MAID OF THE VVEST. OR, A Girle worth gold. The first part. As it was lately acted before the King and Queen, with approved liking. By the Queens Majesties Comedians. LONDON, Printed for Richard Royston, and are to be sold at his Shop in Ivie Lane. 1631. 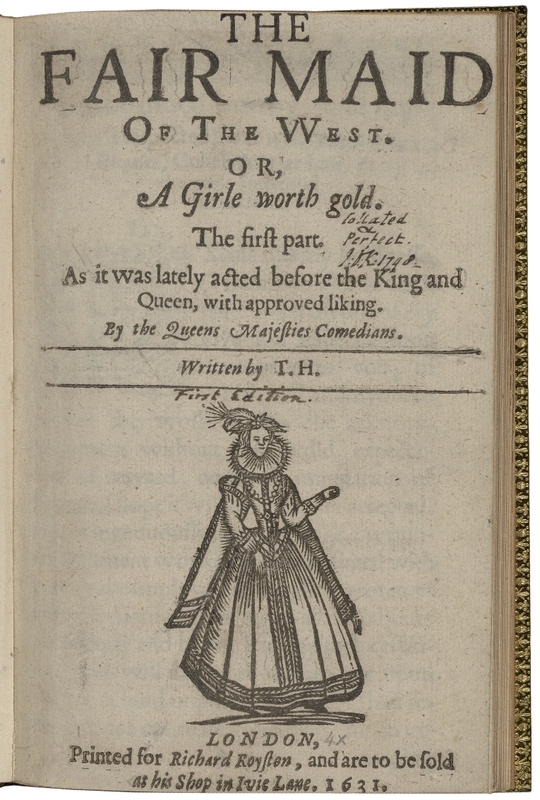 Published as part of a pair of plays, containing: The Fair Maid of the West, or A Girl Worth Gold, 1; The Fair Maid of the West, or A Girl Worth Gold, 2. Title page imaged from Folger call number: STC 13320 v.1. Image is not from the transcribed copy.